Artist Jackie Phillips, the rainbow revolutionist behind Precious Beast, is driven by that sweet feeling you get when you know the colors are just right and the artwork takes on a life of its own. Self taught and armed with acrylic paints in nearly every color of the rainbow, she approaches her pieces pattern first and color second, always in search of the perfect balance of whimsy and pop. Her original designs are currently brightening up spaces all over the world. 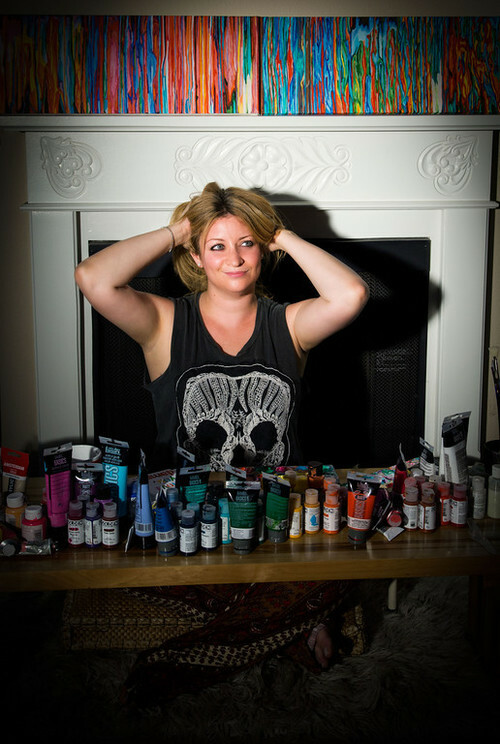 Jackie launched her art studio Precious Beast in December 2010 and, soon after, expanded into graphic design. Late 2013 brought the addition of creative consulting services, where Jackie translates her 10+ year background working among the giants of the entertainment industry (including former FOX Chairman/current TBS & TNT President Kevin Reilly and actor Hugh Laurie) into hands-on guidance for others. Her current list of clients includes artists, designers, photographers, bloggers, actors, executives, writers, entrepreneurs, nonprofits, and retail shops. Via her collaborations, Jackie’s work reaches an average of six-million people every week. The Denim Jungle is her debut as a children’s book illustrator.